NEW YORK, August 11, 2016— A new paper from the International Center for Transitional Justice (ICTJ) offers clear, concrete proposals for a new reparations policy in Côte d’Ivoire for victims of serious human rights violations. The recommendations, informed by extensive work in the affected communities, consider a range of options, including compensation (cash payments), rehabilitation, and symbolic measures. According to the 16-page paper, titled, Recommendations for Victim Reparations in Côte d’Ivoire: Responding to the Rights and Needs of Victims of the Most Serious Violations, reparations must go beyond cash payments to satisfy victims’ rights and meet their enduring needs. Forms of non-monetary reparations requested by victims in interviews with ICTJ include: health care, psychosocial support, access to education, efforts to locate the missing and forcibly disappeared, and a public apology on behalf of the state. The Ivorian government is obligated to provide reparations to the victims of both the post-election crisis that shook the country in 2010-2011, during which over 3,000 people died and hundreds of thousands were displaced, and the different periods of political violence and armed conflict since 1990. It is now up to the government to define its reparations policy, in consultation with victims, affected communities, and the general public. It must decide, for instance, how family members should be compensated for the loss of a loved one and whether scholarships should be included for victims’ children to help them complete their schooling. ICTJ has been working on reparations in Côte d’Ivoire with victims’ groups and government entities, including the National Commission for Reconciliation and Compensation for Victims (CONARIV) and the National Program for Social Cohesion (PNCS), since 2012. It has facilitated a process of consultation and dialogue to learn from victims, including youth and those in some of the most affected areas, about their needs and demands. This involved bringing victims from hard-hit areas to speak directly with national officials about their priorities. ICTJ’s proposals for reparations are framed around four fundamental principles: 1) the need to set priorities in terms of types of violations; 2) the need to focus on “natural persons” (rather than businesses, for example); 3) the need to implement a comprehensive policy that responds to the many different consequences of violations; and 4) the need to adopt a clear implementation strategy that provides some measure of certainty to victims. For instance, in Bouaké, victims reported that poverty, poor health care, and lack of access to quality education continue to affect them. They demanded schools that were neglected and damaged during the war be reconstructed as part of comprehensive reparations for their community. Above all, participants encouraged the general public, and especially fellow victims, to be informed about the reparations process and get involved. “To succeed on a large-scale, a reparations policy like Côte d’Ivoire’s needs to set priorities and know where to begin, or else there is a risk that those in most need may not get the acknowledgement and redress they deserve,” explains Cristián Correa, co-author of the paper and ICTJ’s senior associate for Reparative Justice. An Ivorian reparation policy has already been partly defined, following the announcement in August 4, 2015, that 1 million CFA francs (approximately USD $1,685) in compensation would be paid to each victim in urgent need, as part of an Emergency Reparations Fund. “It must be understood that different forms of reparation will have more impact on some victims than on others, which is why it is particularly important to recognize the most vulnerable and their unique situation, in particular, women, children, and the elderly,” says Correa. For collective reparations projects, the paper stresses that communities should be consulted first about any projects intended for them, to ensure they may have reparative effect. ICTJ urges the Ivorian government to carry out a full budgetary exercise and draw up estimates based on the profile and numbers of victims who have already been registered by CONARIV, to generate reliable figures and to help set priorities. Click here for an in-depth blog post on ICTJ’s consultations with victims by the paper’s co-authors, Cristian Correa and Didier Gbery, and here for a gallery of photos taken during consultations. 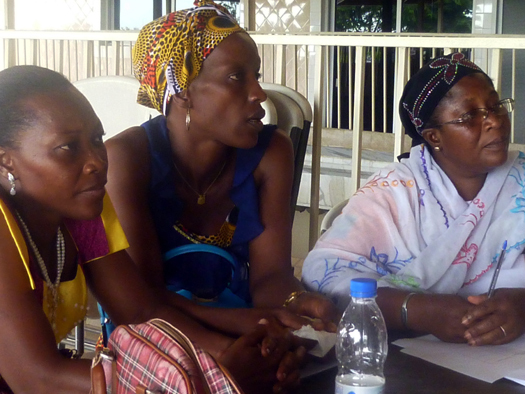 PHOTO: During consultations, three women from Abobo and Yopougon listen to their peers’ recommendations for reparations policies.